^ a b c Mundy, N. Winchell C. Burr T. Woodruff D. (1997). "Microsatellite variation and microevolution in the critically endangered San Clemente Island loggerhead shrike (Lanius ludovicianus mearnsi)". Proceedings of the Royal Society of London B. 264 (1383): 869–875. doi: 10.1098/rspb.1997.0121. PMC 1688432. ^ Craig, R; DeAngelis, D; Dixon, K (1979). 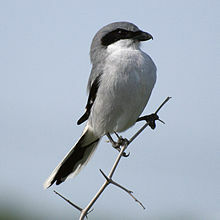 "Long- and short-term dynamic optimization models with application to the feeding strategy of the loggerhead shrike". The American Naturalist. 113 (1): 31–51. doi: 10.1086/283363. ^ a b Sustaita, D; Owen, C; Villarreal, J; Rubega, M (2014). "Morphometric tools for sexing loggerhead shrikes in California". The Southwestern Naturalist. 59 (4): 562–569. doi: 10.1894/ekl-06.1. ^ a b c d Collister, D; Wicklum, D (1996). "Intraspecific variation in Loggerhead Shrikes: sexual dimorphism and implication for subspecies classification". The Auk. 113 (1): 221–223. doi: 10.2307/4088949. ^ Cade, T (1992). "Hand-reared loggerhead shrikes breed in captivity". Condor. 94 (4): 1027–1029. doi: 10.2307/1369306. ^ a b Chabot, A; Titman, R; Bird, D (2001). "Habitat use by Loggerhead Shrikes in Ontario and Quebec". Canadian Journal of Zoology. 79 (5): 916–925. doi: 10.1139/z01-039. ^ Yosef, R; Grubb, T (1992). "Territory size influences nutritional condition in nonbreeding loggerhead shrikes (Lanius ludovicianus): a ptilochronology approach". Conservation Biology. 6 (3): 447–449. doi: 10.1046/j.1523-1739.1992.06030447.x. ^ Mikula, P.; Morelli, F.; Lučan, R. K.; Jones, D. N.; Tryjanowski, P. (2016). "Bats as prey of diurnal birds: a global perspective". Mammal Review. doi: 10.1111/mam.12060. ^ Sustaita, D; Rubega, M (2014). "The anatomy of a shrike bite: bill shape and bite performance in Loggerhead Shrikes". Biological Journal of the Linnean Society. 112 (3): 485–498. doi: 10.1111/bij.12298. ^ Atkinson, Eric C.; Cade, Tom J. (1993). "Winter foraging and diet composition of Northern Shrikes in Idaho" (PDF). Condor. 95 (3): 528–35. doi: 10.2307/1369596. ^ Etterson, M; Howery, M (2001). 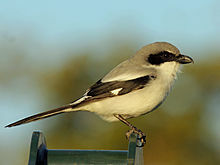 "Kleptoparasitism of soil-foraging passerines by loggerhead shrikes". Journal of Field Ornithology. 72 (3): 458–461. doi: 10.1648/0273-8570-72.3.458.